Time Warner Cable's Advertised $89.99 Triple Play: Now $190.77. What the F@$#X$!? 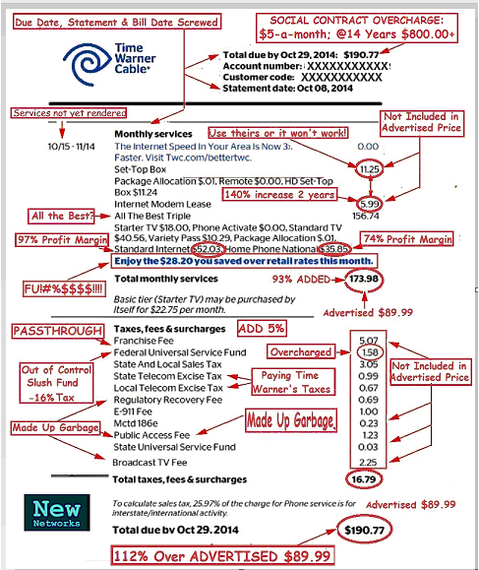 From: "The Book of Broken Promises: $400 Billion Broadband Scandal & Free the Net"
This is my October 2014 Time Warner "Triple Play" bill. When I signed up, less than two years ago, it was advertised at $89.99 and today, less than two years later, the actual price is 110% more -- now $190.77. Click for Full Size. Fact is -- you can never, ever get the advertised price because it doesn't include many of the fixed costs, like the set top box, not to mention it is littered with pass-throughs of the company's taxes and fees, including the cable franchise fees. To add insult to injury, there are a bunch of garbage, made up charges, and let us not forget the increases on all services -- the 'Internet modem' fee went up 140 percent. Not to mention I was overcharged as the Universal Service Fund calculation is wrong by $.07 -- not in my favor. I know most of you reading this "feel my pain." This bill is like going to a restaurant and ordering the $20.00 dinner 'special' only to get a bill of $38.68, not counting the allowable taxes. When you ask the wait-person about the extras, they respond -- Well, there is a "silverware rental" fee -- you could have brought your own utensils, right? A "garbage disposal fee"-- someone had to clean off your plates and take out the trash. And, of course, a "no smoking" fee, because if people could smoke in here, we'd make more money. First, there should be immediate rate reductions on all services as Time Warner Cable, Comcast, et al, have a monopoly over the cable wire -- I can not simply go somewhere else with my business if I'm unsatisfied. There is no competition for fundamental services, such as 'cable service' or 'high-speed Internet', with a bundle to 'save money', except for, in my case, Verizon, who also uses the exact same, deceptive billing practices. Because AT&T and Verizon never upgraded most of their territories for cable, over 50% don't have a second 'triple play' choice. And don't think that the companies can't afford rate reductions. Time Warner Cable showed a 97% profit margin on 'high-speed Internet', as told by their own 2013 annual report - i.e., the company's internal costs to offer the service was $1.32 and they made $43.92 on average. In my case, the price is $52.03 (not counting the applicable taxes, fees and surcharges) and I have the standard, basic package. Second, there should be an investigation of the Social Contract and the extra $800.00+ per household that may have been charged to customers. In 1995, the FCC allowed Time Warner (and Comcast) to add up to $5.00 a month to pay for network upgrades (like high speed Internet) and the wiring of schools. There is no proof that this additional charge was ever taken off the bill or that the schools were wired. Third, every ridiculous, made up charge should be immediately removed. Period. These charges are part of the cost of doing business for the company. Period! Add them to the advertised price or remove them. Fourth, every tax, fee and surcharge added to this bill that has been 'passed through' should now be paid by the company. I.e., there is a tax or fee that is supposed to be paid by the company, but they get to pass it on to you, the lucky customer. Fifth, clean up this deception. This is not a 'promotional price'; it is a deceptive practice that has been allowed to continue for too long. All "must pay to get service charges" should be part of the advertised price. This includes the set top box, which Time Warner's 'agreement' states that other boxes may not work with the Time Warner system. Finally, the merger of Time Warner and Comcast...? You got to be kidding me! Allowing Time Warner Cable to merge with Comcast, where both have been rated as 'the most hated companies in America', is not in the Public Interest. This is just another version of this bill. Rotten to the core. Let's examine some of the charges. I note that New Networks Institute & Teletruth's marked up Verizon local service bill is almost always in the Top 5 of any image search for the words 'phone bill'. This Time Warner Cable bill is just more of the same. Due Date, Statement & Bill Are Screwed -- This bill is for 'services not yet rendered' from October 15-November 14. The "statement date", Oct 8, doesn't match the timeframe given. This is just one of many truth-in-billing, truth-in-advertising issues. The Set Top Box is now $11.25 and the agreement states that other set top boxes may not work. This charge is not included in the advertised price. "Features and Functionality May Differ. Our Services may operate differently depending on the equipment you use to receive them. For instance, if you choose not to lease a set-top box from us, you may be unable to view all available channels for the tier of Service you receive or to perform certain two-way operations." The $89.99 package increased 93% in hard dollars to $173.98 (without the taxes, fees and surcharges) in less than 2 years. I never changed the original service. "Enjoy the $28.20 you saved over retail rates this month. From the New York State Public Service Commission, NY taxing authority and the FCC. Cable Franchise Fee -- "State regulations do not require that there be a franchise fee for cable television service." Most of the cable companies claim that they pay franchise fees when in fact most of it is passed through. Regulatory Recovery Fee -- "These charges are not mandated by state or federal authorities and are therefore not charged separately by all telephone companies." Universal Service Fund -- FCC: "This line item appears when a company chooses to recover its USF contributions directly from its customers by billing them this charge. The FCC does not require this charge to be passed on to customers." Telecom Excise Tax -- "Unlike the sales tax, the excise tax is imposed on the telecommunications provider, but it may be passed through to the consumers of the service and appear on their monthly bill." 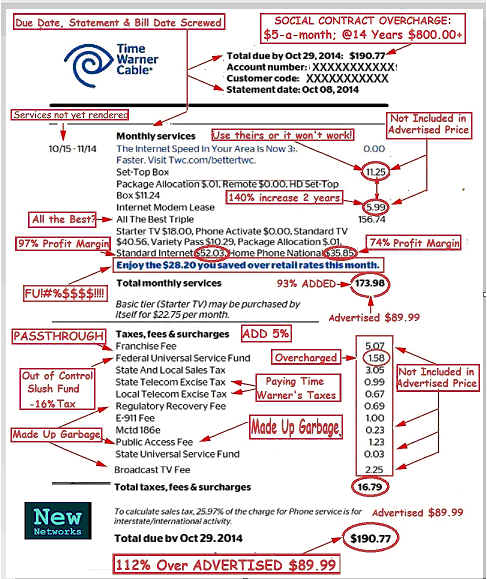 Time Warner Cable's definitions: Understand Taxes on Your Bill. CONCLUSION: The Emperor has no clothes. We've all been had. This is an abuse of all customers and it needs to end now. In the next few weeks I will be writing more about this topic and what we can do to fix these problems.